I did it! Six months of training came together and I completed the Cotswold 113 middle distance triathlon on Sunday! I’m a half-ironman! Everything went exactly as I’d hoped and I finished in 6 hours, 37 minutes and 22 seconds. Four days on from the race and I’m still on a high. It’s taken me a while to get my thoughts together to write a race re-cap, as I want to remember every detail of the day. What made this race so special was that I competed alongside my husband Glen, brother Sean and friend Hayley. We were supported on the course by my parents and their dog Murphy, Hayley’s boyfriend Richard, Sean’s girlfriend Rachel and her parents Ian and Jackie. Glen and I were up at 4am to eat porridge, check our kit and cycle the two miles from the hotel to the race start. A beautiful sunrise over the lake greeted us as we entered transition. Sean was already set up and we laughed at the tupperware container of dates and grapefruit next to his bike- I’m not sure when he planned to eat this! It was already spitting with rain so we wore black bin sacks to keep dry. I checked our tri club Facebook group, wishing luck to the members who were racing at Staffordshire on the same morning. I wrapped my kit in plastic bags to keep it dry. Satisfied that I had everything I place (I remembered my trainers this time), we headed over to the swim start for the briefing. I felt surprisingly calm as we waited to begin. We zipped up our wetsuits and watched the earlier waves go off whilst waiting for our turn. We were set off in waves at 10 minutes apart, with myself, Glen, Hayley and Sean all in wave number 4 at 6.30am. Having attended the familiarisation day, I was aware of the swim course and was pleased to hear that the water temperature had risen to almost 20 degrees. The swim is usually my favourite part of a triathlon and today was no different. I got into a rhythm quickly and felt strong in the water. As we set off, I thought “this is it, I’m doing it”! As we had started to the far right, the water was fairly clear and I didn’t really get kicked or knocked around too much. I saw a man having a panic attack and withdrawing from the swim after just minutes, it was such a shame to see. The route took us around the perimeter of the lake in an anticlockwise direction, with a “dog-leg” around the halfway point to make up the 1900m. I’d expected to finish the swim in around 37-38 minutes, so I was delighted to see 33 minutes on my Garmin when I got out of the water. I did a fist-pump- the day had got off to the great start! Glen and Sean’s bikes were already gone, meaning that they were safely through the swim out on the road. Hayley’s bike was still racked, but she joined me after just a minute. The rain hadn’t yet started, but the black clouds overhead indicated that it wouldn’t be long. I put on my club cycling jersey plus a waterproof jacket over my trisuit. I spent a little longer than usual in transition, making sure I was prepared for the cycle leg. As I headed out, I saw Rachel and Richard waving from the sidelines. The first section of the bike was along the long straight ‘Spine Road’ passing by our hotel, before going onto quieter country roads. After only a few miles, the rain started and it was torrential! The rain flew in from all angles completely drenching me- it had been pointless wearing my jersey and jacket. I had my sunglasses with clear lenses, but soon took them off as I couldn’t see a thing! My finger tips were wrinkled and my shoes were squelching with every turn of the pedals. 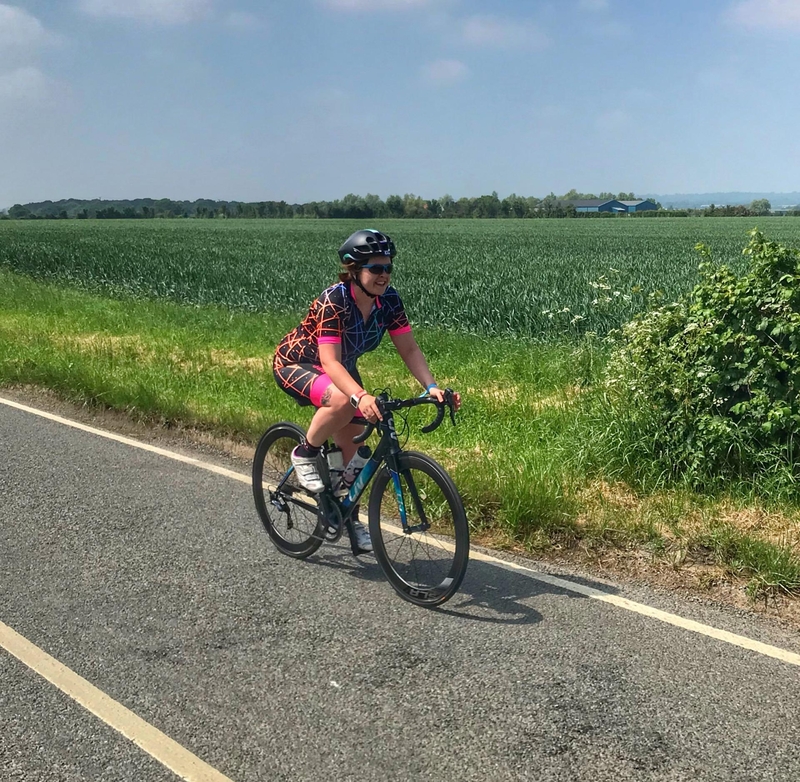 I’d expected Hayley to overtake me fairly soon into the bike course, but I hadn’t seen her, I hoped she was OK.
My plan had been to take a sip of electrolyte drink and a bite of Nakd bar every 5 miles. My Garmin was set up to remind me and this worked well, I was taking on nutrition and hydration exactly as planned. Although as the rain wore on, it got into my feed bag and turned my Nakd bar bits into sticky, congealed brown mush. It looked really unpleasant! Having attended the familiarisation day, I was aware that the course was completely flat with just two hills at around miles 14 and 16, which would be repeated again at miles 42 and 44. On the first lap, I was able to power up both hills and enjoy the free speed on the descents. My first lap went smoothly, I completed the 28 miles in 93 minutes. As I went through the turn-around point, I saw my parents and their dog Murphy- it gave me a huge boost to hear their cheers. The fatigue started to set in on the second lap, my pace was slowing and my shoulders and hips started to ache. The rain hammered on. I stayed positive, smiling throughout and thanking each marshall as I passed by. Other competitors were very friendly, so many people shouted “great work Lucy” “keep going” as they flew past me on their TT bikes. I’m not ashamed to say that I actually got off and walked the hill at mile 42. As I approached the hill, I realised I didn’t have enough momentum going and I felt too fatigued to push myself up it. It was at this point that Hayley overtook me- I wondered what had taken her so long! I didn’t know at the time, but Glen also had problems at this hill on his second lap. At the bottom of the hill, he got knocked off his bike by someone who pulled in too closely and damaged his rear derailleur. Sean used this opportunity to overtake him! Glen was fine except for bruises and managed to finish the rest of the course with only six useable gears. Unfortunately the photographer missed me on the bike course, but these photos of Glen and Sean show the rain in full effect. Around mile 46, I realised the rain had finally stopped! Just 10 miles left! Dismounting the bike, I let out a huge groan, it was a relief to be upright again as I was so sore. I had predicted completing the bike course in 3:15 to 3:30, so I was right on target. It felt so good to put on clean and dry socks for the run- it was a good call to bring two pairs! I took off my jacket but decided to keep the cycling top on over my trisuit. Just a half-marathon to complete! Heading out on the course, I felt like I was plodding along with heavy legs. I consciously ignored my watch as I knew I’d be keeping a slow pace and didn’t want to get disheartened. This was unlike any half-marathon I’ve run in the past, my legs were already ruined from the start! I broke the course down mentally into the three laps of 4.3 miles. I just focused on getting each lap done rather than thinking of the bigger picture. I would pass by the finish line twice, before being allowed to cross it on the third and final lap- always tough to be near yet so far from the finish! I also got to see my supporters on each lap which gave me something to look forward to! The course was mostly on paths around the lakes, which had been churned up by the previous runners and were very muddy. It took concentration to avoid slipping over! In some places the paths were very narrow, so I kept to the side to not hold up the faster runners coming from behind me. The rain held off and I started to dry out. Amazingly I didn’t have any pain in my legs, after having struggled with shin splints this year. I generally felt good, except for soreness in my shoulders from the bike. I alternated between walking and running, taking it at a fairly leisurely pace. Some areas of the course were more lonely than others, I enjoyed the parts which were full of supporters but struggled on the quieter sections. The run course crossed the cycle route at one point, so we had to stop for a few seconds to allow the final cyclists to pass. We went through two feed stations on each lap. The tables were laden with a huge array of food… crisps, nuts, fig rolls, chocolate biscuits, jaffa cakes, Haribo, bananas. For a moment, I thought I was at a party, not in the middle of a triathlon! I took some food and put some more into my pockets for later. I also took a cup of each of the drinks on offer- water, flat Coke and High 5. I’d been recommended the flat Coke by clubmates to get sugar and caffeine into my system without upsetting my stomach. Half way through my second lap, I reached the feed station and was surprised to see Hayley who was struggling with blisters. We ran together for a while before I felt myself pulling away and pushing on. At this point, it was 5 hours and 20 minutes since we started the race and I predicted that Glen and Sean would be finishing. With one lap to go, I saw my parents, their dog Murphy and Glen who had already finished. I stopped for a few seconds to chat to them. My Dad joked that they only had half a dozen medals left at the finish line so I’d better hurry up! They know I love a medal! I told them I’d be back in 50 minutes and pushed on for the final 4.3 miles. On the last lap, the competitors on the course had thinned out with the faster athletes long since finished. I chatted to marshalls and other competitors who were pushing through their final lap. I kept reminding myself it was the last time I’d ever have to run around this lake! I rounded the corner from the woods onto the muddy lane leading to the finish chute and started to pick up my pace, just as the rain started AGAIN! My family roared in support and I high-fived strangers as I ran onto the muddy red carpet. Crossing the finish line was emotional. I collected my medal and burst into tears repeating “I’ve done it, I’ve done it”. Within seconds, I was surrounded by my family congratulating me. Murphy jumped all over me and my Mum started to cry. Glen and Sean had finished strong in 5:09 and 5:27 respectively. Hayley crossed the finish line just 5 minutes after me. I instantly felt exhausted and remembered I had to cycle the few miles back to the hotel! Glen and I spent the next three days relaxing in our hotel spa and exploring the Cotswolds. I’ve been asked several times whether I will do another 70.3 triathlon. To be honest, I don’t predict another in the near future- I’m sticking to shorter distances for now. Overall the event was amazing and extremely well organised. I wouldn’t hesitate to recommend the Cotswold 113 to anyone looking for a fast, flat and friendly middle-distance in a beautiful part of the world. Obviously the weather could have been better! So many people supported me in the build up to this race. A huge thank you to my coach Jon for his advice and guidance, there was a method in the madness! Thank you also to all my friends at Havering Tri who encouraged me from the day I joined the club. Thank you to my mentor Kay for your advice and teaching me to swim! Thank you to Mum, Dad, Murphy, Rachel, Richard, Jackie and Ian who stood out in the rain to watch us. Thank you to everyone who reads my blog and takes the time to comment, tweet or email me. Well done and a massive achievement. I just finished this race a few weeks back in preparation for Ironman Copenhagen where I plan to go under 10 hours. Well done again, and keep it up! Congratulations you too! This was last year for me, I’m doing mostly sprint and olympic distance this year. Good luck for Copenhagen- sub 10 is an amazing target! Your face in every single photo says it all, Lucy! Well done! Incredible! I’d love to do something like this, but I literally cannot run to save my life right now! I could manage the swim and cycle though! 2/3 of the way there! Thank you! Running was also my weakest area after having several injuries. I did walk a lot of the half-marathon as I mentioned, so I was slow but got it done! Hi Lucy, I was waiting for your race recap. I loved that you detailed the story, and the pictures, and that you put your expectations .Great race and congratulations on your achievement!!! You did it!!! I encourage you to go talk to school aged children about the beauty of setting goals and achieving them. You are a passionate person and one can see that in your writing. If ever you want to do a tri in my part of the world, you have a friend in me that would welcome you on the Eastern Coast of Canada. I am hoping to do a half-ironman next year and will start planning and training for it. For now, I’m sticking to shorter distances. The day of your race, I did a short distance tri, the second one after almost 10years break to bear a few children. : ) I thought of you and it helped me push during my run and bike legs. Thank you for having this blog and looking forward to seeing what your next goal will be! Thanks Nikki, you are awesome too! Wow, congratulations, that is such a fantastic achievement! I can’t even imagine running a half marathon after doing all that swimming and cycling- very impressive. Thank you 🙂 Yeah I wouldn’t have imagined doing it a few years ago, but I guess when you set your mind to something and train for it then anything is possible!